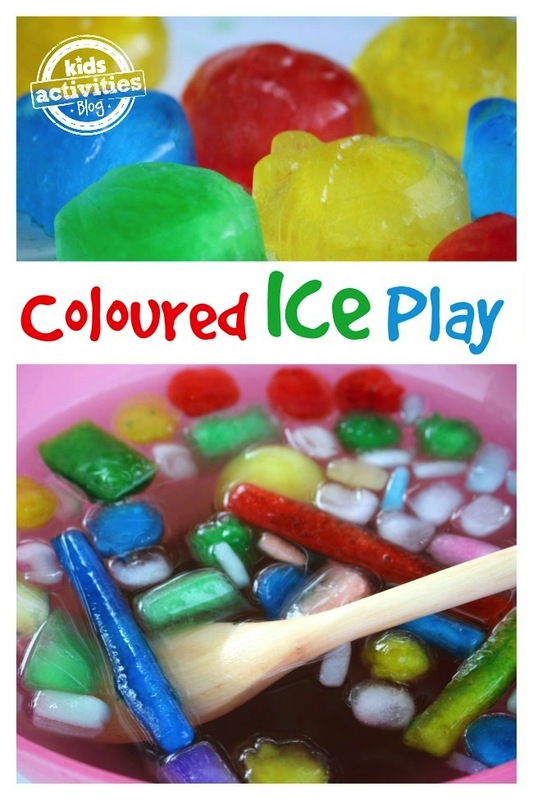 It doesn’t matter what time of year it is, coloured ice is always a hit with kids. 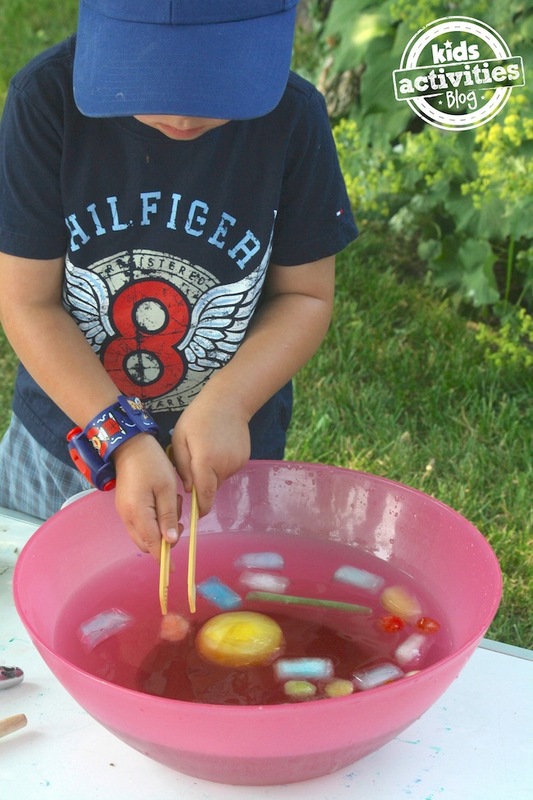 But in summertime, a water bin filled with coloured ice cubes is just the best! It’s perfect for keeping the kids cool and refreshed on a hot, summer day! 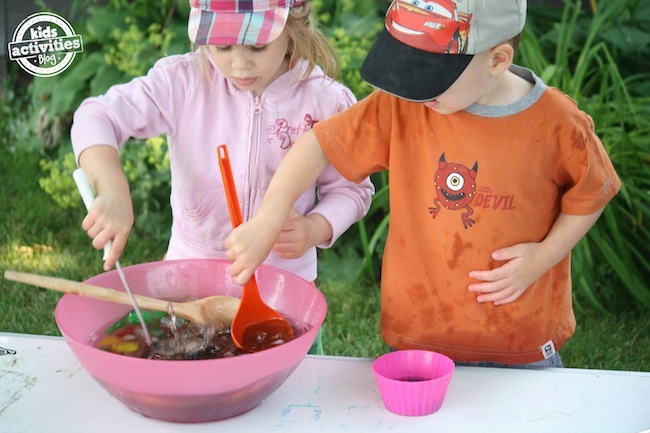 With warm weather on the horizon, it’s time to start thinking about fun summer activities to keep your kids cool and having fun in the backyard! One of our favourite ways to pass a warm summer morning is to add a big batch of coloured ice cubes to a bin of cold water. 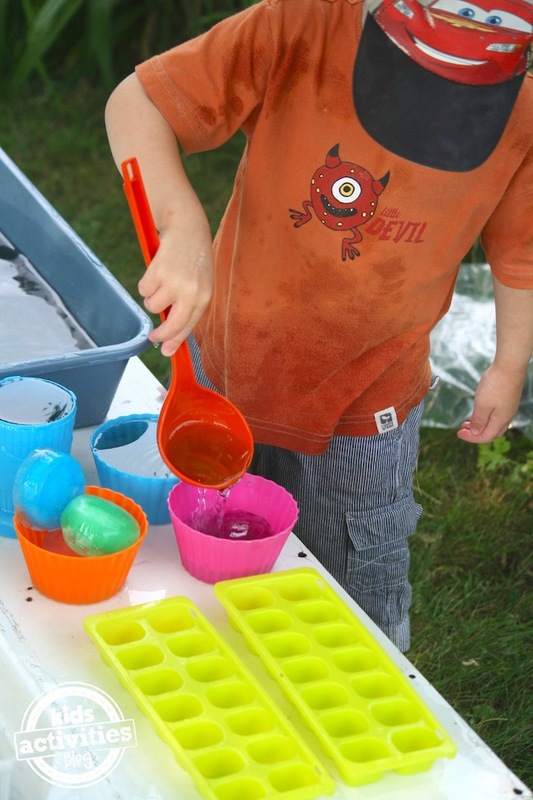 It keeps everyone cool, and it’s so much fun to scoop, pour, mix and stir while the ice cubes slowly release their colour into the water. various kitchen instruments: scoops, funnels, tongs, spoons, basters, ladles, sieves, etc. It’s best to start freezing your ice several days in advance so you’ll have lots on hand for your activity. 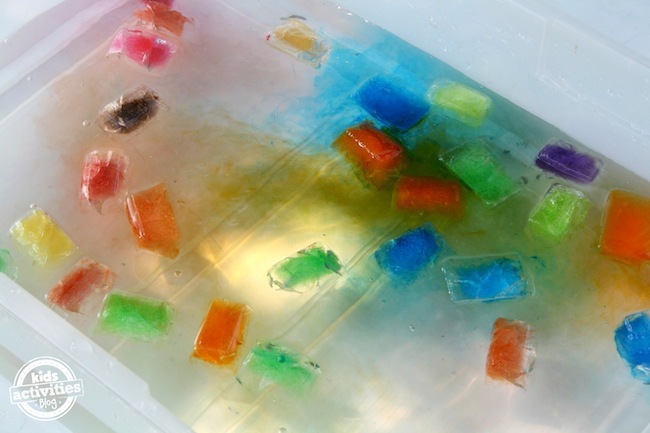 I fill several ice cube trays and small plastic containers with water, add a drop or two of food colouring to each section, and load them all onto a baking sheet. I place the baking sheet into the freezer, and when the ice is solid, I transfer the coloured cubes into a plastic bag which stays in the freezer, and I begin again. I’ll do this over and over until I’ve accumulated a supply of several hundred coloured ice cubes. This way, the kids can enjoy a whole morning of play! Thrift shops and second-hand stores are great places for picking up ice cube trays in all kinds of shapes and sizes. 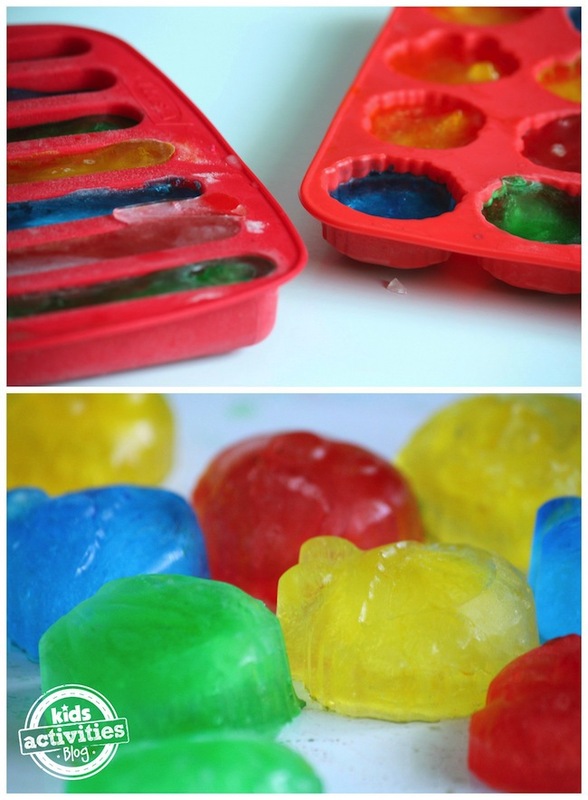 Popsicle moulds and small, shaped plastic containers are super for this too. When we’re ready to play I take a large, clear storage bin out to a shady area of the yard and I fill it with very cold water. The colder your water is, the longer your ice cubes will last. The coloured ice cubes will make the water even colder. You’ll be surprised at how long the ice will last, even on a hot day. I set the kids up with all kinds of kitchen utensils and instruments: large and small bowls for scooping the ice into, ladles, sieves, tongs, wooden spoons etc. Anything goes really. I just rummage through my kitchen drawers and cupboards until I’ve come up with a wide variety of instruments for them to play and experiment with. Let the ice play commence! Dump in a batch of ice, and let the fun begin! My guys can spend an entire morning playing with an activity bin like this. They scoop, they pour, they strain, they sort. The mix potions and they make soups, ladling out bowls for everyone and pouring their concoctions from one container to the next. 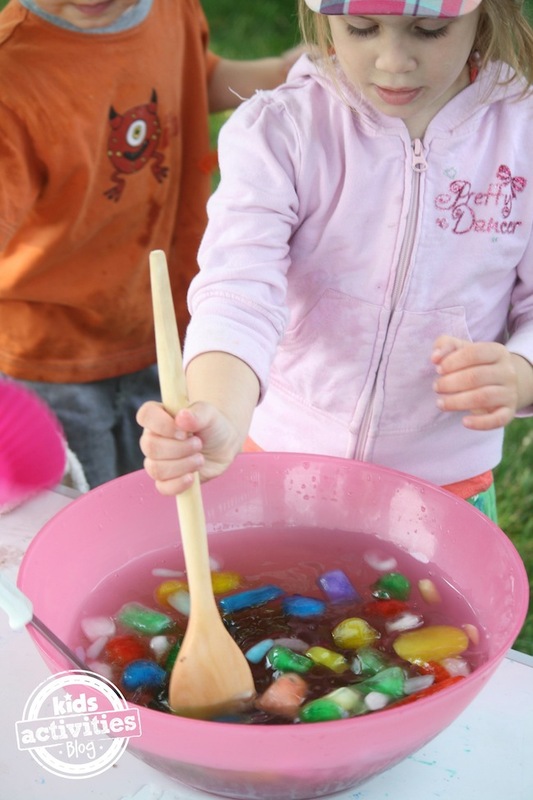 It’s fun to watch the colour leach out of the ice cubes and colour the water as they play. Hours of splashing, exploring and learning. What a wonderful way to spend a hot summer morning. You may even get a chance to sit back and put your feet up while your kids are kept cool and happy! If you’re looking for another great way to play with coloured ice, check out our ice painting activity! That’s another one you’ll want to try this summer!